It’s time to think of the autumn phase of the garden already. When we picture autumn we picture the trees ablaze with color, at least here in the Midwest, and in the Northeast of the USA. Other players on the stage, perhaps with a supporting role, but many of them bring lots of color and add to the tapestry of of the season… and one of those is in the cabbage family. I tried growing my own flowering kale this year. I bought little plants early in the season, but it turns out to have been a bad idea: they have bolted in the heat and now it looks like I will have to buy plants at the nursery again if I want their fall and early winter color. Maybe I can save some seeds, but I don’t’ know if they would come true or not. Sometimes early is not the best policy, at least for cool weather crops. Since flowering kales are cole crops they need the same growing conditions: good quality soil, well fertilized. Good drainage, and medium moisture AND cooler temperatures. For more detailed instruction on growing this plant, go here. I put mine in pots last year with sprigs of ivy and pine, and bright red bows. Once a hard freeze comes to stay (until temperatures drop to 15 to 20F), they do get frozen, and then smell pretty bad, but until then they give pretty colors and something living to enjoy during most of the usually dormant season of winter. Fancy foliage for showcasing other fall plants and flowers in the autumn and the center stage during winter when the ruffled edged leaves and the green plus white or purple stand out in the drab landscape. 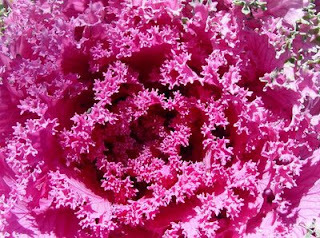 Although I’ve never done this, flowering kale can be used as a “cut flower”. The kale types, not the cabbage ones, are supposed to be edible- so you could use them as garnishes. The main problem edibility is whether they have had chemicals added to reduce the “legginess”. 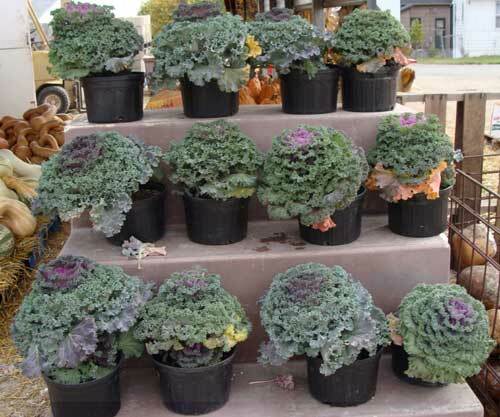 A great description of the possible colors and hybrids available, Ornamental Cabbage. 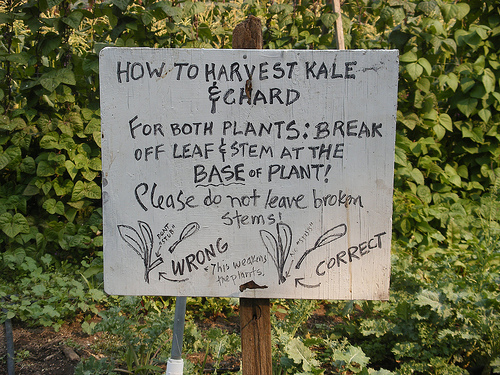 Cute way to teach “how to harvest kale”.